Regular breeding resident and migrant; the Prothonotary Warbler was a rare species during the Minnesota Breeding Bird Atlas (MNBBA). Primarily restricted to the southeastern United States with local populations extending north along major river valleys, including the Mississippi River. The Prothonotary Warbler is sparsely distributed throughout most of its breeding range; densities are highest along the lower Mississippi River valley in Louisiana and in coastal wetlands in Virginia and North Carolina (Figure 1). Assigned a Continental Concern Score of 14/20 and designated a Yellow Watch List species by Partners in Flight; designated a Species in Greatest Conservation Need by the Minnesota Department of Natural Resources. A medium- to long-distance migrant that winters in Central America and northern South America. A bark and foliage gleaner that feeds primarily on insects. Unique among eastern wood warblers as a secondary cavity nester, using former cavities excavated by Downy Woodpeckers, natural tree cavities, or nest boxes. Breeding distribution and relative abundance of the Prothonotary Warbler in North America based on the federal Breeding Bird Survey, 2011-2015 (Sauer et al. 2017). Roberts (1932) provided a detailed account of the first reports of this stunning floodplain-forest species in Minnesota. It was found on the Wisconsin side of the Mississippi River, east of the mouth of the Root River, in 1874 by Dr. Hvoslef of Lanesboro, Minnesota. Another 16 years passed before the first documentation of its presence on the Minnesota side of the river, in 1890, when a local birder in Houston County reported it was breeding near the town of La Crescent in “limited numbers” (Harrison 1890). A few years later, in 1898, a journal article detailed additional breeding records from islands along the Mississippi River in an area that stretched from the town of Red Wing south to Lake Pepin (Johnson 1898). These records led Roberts to conclude that the species first appeared in Minnesota sometime between 1870 and 1890. The same year that Johnson published his account, 1898, Roberts and a colleague, Dr. L. O. Dart, traveled along the Mississippi River from Hastings to the Iowa border. The Prothonotary Warbler was common along the entire stretch of the river, “increasing in numbers as we went southward. It was confined strictly to the bottom-lands and almost entirely to the wooded and periodically flooded islands.” Although records of single birds gradually accumulated from other Minnesota localities, including Fillmore, Olmsted, Hennepin, and even Crow Wing Counties, the stretch of floodplain forest south of Hastings was considered the species’ primary breeding range. There was one notable exception. In 1915, “a small colony” of Prothonotary Warblers was found in a floodplain channel along the Rum River, a tributary to the Mississippi River, in Isanti County, and was present for many years. How the birds found a locality so far from their primary breeding range was an enigma to Roberts: “Conditions there are ideal though limited in extent. The valleys of the St. Croix and Minnesota rivers, farther south, offer equally satisfactory and much more extensive nesting-grounds, but thus far they have been passed by.” At the time of his writing, Roberts (1932) had confirmed nesting reports from three counties: Goodhue, Houston, and Isanti. In the following years, additional reports of the birds outside of their primary range were documented. In 1941 there was a report of nesting at another location along the Rum River, in Anoka (Breckenridge 1945), and during the summer of 1945 a well-established breeding population was documented along the St. Croix River, from Stillwater north to Taylors Falls (Hubert 1945). Other reports included documented nesting along the Mississippi River north of downtown Minneapolis in 1951 (Eastman and Eastman 1952) and observations of several males in Stearns County in 1961 (Russell and Hibbard 1964). When Green and Janssen provided an updated account in 1975, they described the Prothonotary Warbler as a summer resident in southeastern Minnesota and along the Mississippi, Rum, and St. Croix Rivers in central Minnesota. Breeding had been confirmed in 8 counties: Anoka, Goodhue, Hennepin, Houston, Isanti, Ramsey, Wabasha, and Washington. A few years later, Janssen (1987) described it as a regular summer resident as far north as central Chisago County and as far west as Scott County. There was even 1 nesting report farther up the Minnesota River valley in Brown County in 1984. Since 1970 nesting had been confirmed in 6 counties: Brown, Hennepin, Houston, Ramsey, Wabasha, and Washington. Hertzel and Janssen (1998) later eliminated the Washington County record and added 6 more counties to Janssen’s list: Anoka, Dakota, Nicollet, Scott, Sherburne, and Winona. The Minnesota Biological Survey reported 56 breeding season locations for the Prothonotary Warbler during the course of their work in southern and central Minnesota (Minnesota Department of Natural Resources 2016). Every record was located along one of the three major river valleys: the Mississippi, St. Croix, and Minnesota. Their distribution map closely paralleled that of Janssen (1987). During the MNBBA, observers reported 40 Prothonotary Warbler records in 28 of the surveyed atlas blocks and in 13 of the priority blocks. Breeding was confirmed in 9 blocks (Figures 2 and 3; Table 1). The birds were detected in 19 of Minnesota’s 87 counties (several blocks along the Minnesota River straddled 2 counties) and were confirmed breeding in 9 counties: Carver, Goodhue, Nicollet, Le Sueur, Rice, Scott, Sherburne, Wabasha, and Washington. Four counties were included because of blocks that straddled 2 counties (Nicollet/Le Sueur and Carver/Scott). Five of the counties were additions to the list published by Hertzel and Janssen (1998): Carver, Goodhue, Le Sueur, Rice, and Washington. In addition to the long-established distribution of summer residents along the lower Mississippi, St. Croix, and Minnesota Rivers, breeding evidence was gathered in Rice and Sherburne Counties, both from sites located in the floodplains of smaller rivers. Possible records in Lac qui Parle, Freeborn, Fillmore, and northern Hennepin Counties were all located outside of the floodplains of major rivers, but all blocks had some riparian habitat along small streams or rivers. In the nearly 140 years since the Prothonotary Warbler first appeared in Minnesota, its breeding distribution has slowly expanded along the state’s major river valleys as well as along some smaller tributaries. Roberts (1932) considered it the first among several southern species to “settle in numbers in a region so far removed from its normal southern habitat.” Others included the Northern Cardinal, Red-bellied Woodpecker, Blue-gray Gnatcatcher, Tufted Titmouse, Blue-winged Warbler, and Louisiana Waterthrush. Today, four of the seven species now have breeding ranges that extend considerably beyond southeastern Minnesota (Northern Cardinal, Red-bellied Woodpecker, Blue-gray Gnatcatcher, and Blue-winged Warbler). The Prothonotary’s strong association with the floodplain forests of slow-moving, large rivers has probably limited its breeding opportunities elsewhere in the state. Beyond the northward range extensions observed in the late 19th and early 20th centuries, there have been few changes to the species’ distribution in recent decades (Petit 1999). Breeding distribution of the Prothonotary Warbler in Minnesota based on the Breeding Bird Atlas (2009 – 2013). Summary statistics of observations by breeding status category for the Prothonotary Warbler in Minnesota based on all blocks (each 5 km x 5 km) surveyed during the Breeding Bird Atlas (2009-2013). Summary statistics for the Prothonotary Warbler observations by breeding status category for all blocks and priority blocks (each 5 km x 5 km) surveyed during the Minnesota Breeding Bird Atlas (2009-2013). Known for many years as the Golden Swamp Warbler, the Prothonotary Warbler is largely an inhabitant of lowland deciduous forests that are seasonally flooded (Figure 4). In Minnesota, such sites are typically within the floodplains of large river systems including the Mississippi, St. Croix, and Minnesota Rivers. Occasionally the riparian edges of smaller streams, creeks, lakes, and ponds are used as well (Petit 1999; Cutright et al. 2006). The most common features shared by all nesting sites include low-lying, flat terrain, standing or slow-moving waters, a dense forest canopy (50%–75% cover), and a sparse understory (Petit 1999). The species’ preference for nesting over water is believed to be related to higher insect availability (e.g., mayflies and dragonflies) and lower mammalian predation due to the relative inaccessibility of flooded stands (Petit and Petit 1996; Hoover 2006). Several studies have suggested the warbler is area sensitive, avoiding forest stands that are less than 100 ha in size and riparian edges less than 30 m wide (e.g., Whitcomb et al. 1981; Kahl et al. 1985). Typical breeding habitat of the Prothonotary Warbler in Minnesota (© Gary T. Seim). Data collected by the federal Breeding Bird Survey (BBS) were used to generate a continental population estimate of 1.8 million birds (Partners in Flight Science Committee 2013). The estimate is tentative at best and may actually underestimate the true population size. Because the BBS is conducted along roads, the Prothonotary Warbler’s floodplain-forest habitat is not readily accessible even by the secondary roads along which most BBS routes are conducted. In Minnesota, the species was reported only once on one BBS route, in 1992, from 1966 to 2015 (Sauer et al. 2017). Given the species’ rarity, few data are available on local population densities, particularly in the northern reaches of its breeding distribution. In bottomland forests in Tennessee breeding densities averaged 48 pairs per 40 ha (Petit 1986); in inland wetlands in Illinois densities averaged 24 pairs per 40 ha (Kleen 1973). 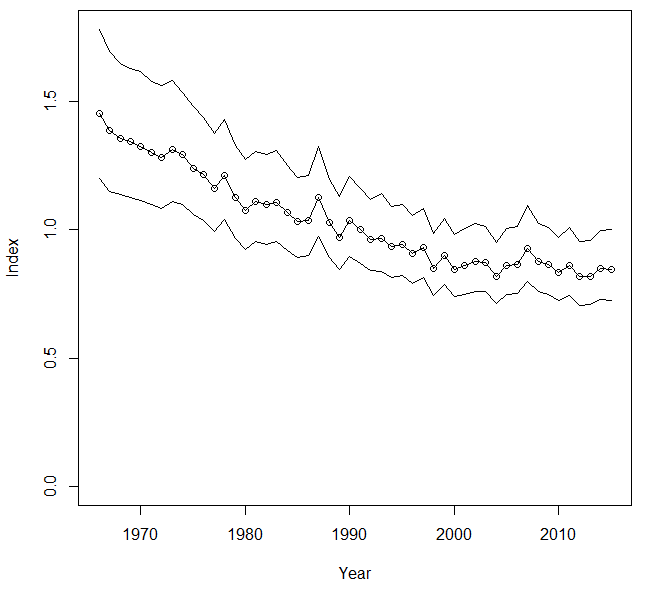 BBS data demonstrated a statistically significant, long-term population decline across North America that averaged 1.10% per year from 1966 to 2015 (Sauer et al. 2017); since 2000 the decline has abated, and the trend line has been relatively stable (Figure 5). The cumulative population loss since 1970 is estimated at 38% (Rosenberg et al. 2016). Both BBS and MNBBA data in Minnesota were insufficient to estimate either a population size or population trend. Factors considered responsible for the decline are varied. The bird’s habitat specificity certainly increased its vulnerability to habitat loss. In the lower 48 states only 10% of the original bottomland forest remains today (Dickson et al. 1995). Hoover (2009) specifically noted impacts to Prothonotary Warblers that resulted from actions that modify the hydrological regimes of floodplain communities. This included the establishment of lateral gullies that facilitate the removal of standing water from lowland forests following spring floods. Competition for nest sites and brood parasitism by Brown-headed Cowbirds were estimated to impact 10% to 27% of nesting efforts and can lead to declines in local populations (Petit 1999). Breeding population trend for the Prothonotary Warbler in North America from 1966-2015 based on the federal Breeding Bird Survey (Sauer et al. 2017). In light of its declining population and habitat specificity, the Prothonotary Warbler has garnered the attention of many resource agencies and conservation organizations. It has been assigned a Continental Concern Score of 14/20 by Partners in Flight. The relatively high score reflects concern regarding its small population size, its declining population, and threats to its breeding and wintering habitats (Rosenberg et al. 2016). The species was also added to the Partners in Flight Yellow Watch List in 2016, a group of 12 species that biologists believe require constant care to prevent further declines. At the regional level, the Prothonotary Warbler is a focal species for the Upper Mississippi River and Great Lakes Region Joint Venture, an effort that includes all of the warbler’s breeding habitat in southern and central Minnesota (Potter et al. 2007). Minnesota has designated it a Species in Greatest Conservation Need (Minnesota Department of Natural Resources 2015). Although the species’ vulnerability to the impacts of climate change has not been examined closely, an initial assessment ranked it as moderately vulnerable (North American Bird Conservation Initiative 2014). Specific conservation measures focus on the need to protect large, unbroken stands of bottomland forests, particularly along the floodplains of major rivers. Within these stands, forest management practices that retain dead and dying trees with potential nest cavities are critical. Riparian buffers that are at least 90 meters wide are also recommended (Potter et al. 2007). Although next boxes are not considered a feasible conservation practice to implement on a large scale, Prothonotary Warblers do readily accept them. Because of the remoteness of Prothonotary Warble’s floodplain habitat, few Minnesota residents have the opportunity to encounter this stunning and unique inhabitant of the backwaters of some of the state’s largest rivers. In the near term at least, we can be content that its future appears secure as long as these vital waterways are protected. Breckenridge, Walter John. 1945. “Prothonotary Warbler Nesting at Anoka.” Flicker 21: 62–63. Dickson, James G., Frank R. Thompson III, Richard N. Conner, and Kathleen E. Franzreb. 1995. “Silviculture in Central and Southeastern Oak Pine Forests.” In Ecology and Management of Neotropical Migratory Birds: A Synthesis and Review of Critical Issues, edited by Thomas E. Martin and Deborah M. Finch, 245–266. New York: Oxford University Press. Eastman, Whitney, and Karen Eastman. 1952. “Prothonotary Warblers Establishing Nesting Colony on Mississippi River North of Minneapolis.” Flicker 24: 34. Harrison, Whit. 1890. “The Prothonotary Warbler.” Oologist 7: 228–229. Hoover, Jeffrey P. 2006. “Water Depth Influences Nest Predation for a Wetland-Dependent Bird in Fragmented Bottomland Forests.” Biological Conservation 127: 37–45. Hoover, Jeffrey P. 2009. “Prothonotary Warblers as Indicators of Hydrological Conditions in Bottomland Forests.” In Proceedings of the Fourth International Partners in Flight Conference: Tundra to Tropics, edited by Terrell D. Rich, Coro Arizmendi, Dean W. Demarest, and Craig Thompson, 128–137. Partners in Flight. Hubert, B. 1945. “Prothonotary Warblers.” Flicker 17: 91. Johnson, C. B. 1898. “Prothonotary Warbler.” Oologist 15: 53–54. Kahl, Richard B., Thomas S. Baskett, Jonathan A. Ellis, and James N. Burroughs. 1985. Characteristics of Summer Habitats of Selected Nongame Birds in Missouri. Research Bulletin no. 1056. Columbia: University of Missouri-Columbia, Agricultural Experiment Station. Kleen, Vernon M. 1973. “The Density and Territory Size of Breeding Prothonotary Warblers (Protonotaria citrea) in Southern Illinois.” MS thesis, Southern Illinois University. Petit, Lisa J. 1986. “Factors Affecting the Reproductive Success of Prothonotary Warblers (Protonotaria citrea) Nesting in Riverine Habitat.” MS thesis, Bowling Green State University. Petit, Lisa J., and Daniel R. Petit. 1996. “Factors Governing Habitat Selection by Prothonotary Warblers: Field Tests of the Fretwell-Lucas Models.” Ecological Monographs 66: 367–387. Russell, Robert P., and Edmund A. Hibbard. 1964. “Southern Birds in Stearns County.” Loon 36: 104. Whitcomb, R. F., Chandler S. Robbins, J. F. Lynch, B. L. Whitcomb, M. K. Klimkiewicz, and D. Bystrak. 1981. “Effects of Forest Fragmentation on Avifauna of the Eastern Deciduous Forest.” In Forest Island Dynamics in Man-dominated Landscapes, edited by Robert L. Burgess and David M. Sharpe, 125–206. New York: Springer-Verlag.